I suppose I'll start with the most recent event. 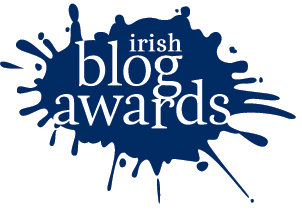 I've been nominated in the Best Food/Drink Blog category of the Irish Blog Awards 2011. And I thank you all for your lovely nominations - I've only really been blogging for a year and this is amazing. I found out on Sunday night & I screamed so loudly that the poor Hubs nearly fell out of the bed with fright. The poor man. And now to complete my Hat Trick of Happy Things... I managed to win not just one, but TWO of the Irish Foodies Cookalong competitions. This was a complete shock as I honestly believe that everybody else had far nicer and prettier dishes than mine. The first one was sponsored by Llewellyns Orchard Produce in October with a theme of Autumn Fruits and I decided to try something new with an Orchard Fruit Shortcake. We were so eager to scoff it, that we almost forgot to take photos. My prize was a bottle each of David Llewellyn's apple juice, real cider and Apple Balsalmic Vinegar. The only thing left is the vinegar, and not for long as it's a fantastic ingedient for dressings & marinades. The second one was Winter Warmers in November and was sponsored by Cully and Sully. This time out, I was inspired by a Domini Kemp recipe and produced a Daube of Pork with Apricots with Colcannon Mash. My prize was a giant hamper stuffed to the brim with Cully & Sully soups, pies and hotpots. We dined like kings after its arrival & my cooking output decreased dramatically! Wow, that is quite a haul - and well earned, congrats! Brilliant and congrats and well done on the hat-trick!! I could say the same for you, oh Nominated One!! !